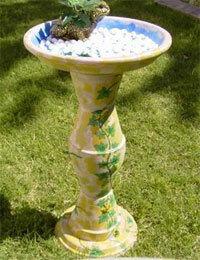 A clay pot birdbath is very simple to make and the birds just love them. Attract birds to your backyard and watch them take a sip of water or splash while taking a bath. 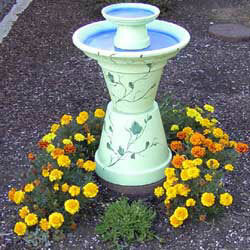 There are many different birdbaths that you can buy or else you can make your own with terra cotta pots. It is so much more fun when you make yours and you have the feeling of accomplishment when you are through. I guarantee that people will ogle your birdbath and want to know how to make one themselves. The first thing you need to do is to simple wipe down your pots and saucer with a damp cloth and let dry completely. Paint your pots with the color you have chosen and then let dry. If you are going to paint a design on them you may want to do that before you glue them together. On my birdbath I didn’t glue it together until I had it all painted. The decorating ideas for your birdbath are endless. You can paint the whole bath like I did and then paint a design on it. You can leave the pots in their original color and put decals on it. Just use your imagination and you will come up with a one-of-a-kind work of art. After you have your pots finished you need to glue them together. I use liquid nails to glue them. Be sure that you have the clay pot dish centered on the top. On the picture of my clay pot birdbath I also put a smaller pot and dish on top. The birds use both baths. When it is all dry you need to seal it. I use clear acrylic sealer spray for outdoors. Sealer is also available in a can and then you just brush it on. Be sure to give it several coats so that it is sealed good. Also make sure that you store your birdbath inside during cold weather months. Where I live I don’t have to because it doesn’t get that cold. This picture is from Sheri and you can see the rest of her story here. I'd love to hear from you. If you have any questions or arts and craft tips that you would like to share please contact me and I will share them with everyone else. Would you like to show the world your favorite craft? It's free and easy. Please click here to make your submission. Blick Art Materials-You can find all kinds of art and craft supplies here that you can't find anywhere else. Purchase scrapbooking supplies from the Scrapbook.com Superstore! Create More, Spend Less at www.CreateForLess.com We offer over 60,000 brand name craft, sewing, quilting, scrapbooking, candlemaking supplies and more.